In today’s society, more people are shopping online and using the Internet to research products. If you are working hard on your marketing and SEO, you may see a lot of traffic to your eCommerce Store. While this is good for your business, it is critical to keep those people on your website. No matter how much money you spend on your website design, if people can’t find what they are looking for, they will leave your store and drive your bounce rate up. For your eCommerce store, high bounce rates mean people aren’t buying. Follow these tips to reduce your bounce rates to a reasonable level. With high-speed Internet access and lower patience levels, fast load times are critical to keeping people on your eCommerce store. Loading speed is also critical to your SEO efforts. To improve your load times, keep the use of plug-ins, graphics and other slow-loading features to a minimum. Don’t let slow load times hurt your bottom line and drive your customers away. The shopping cart you use is essential to the success of your eCommerce business. Most importantly, your customers must be able to easily locate the shopping cart on your site. The top right corner is often the place customers will look first when trying to find the shopping cart. Make sure it is also easy to view, add and delete items from the cart. Internet users are using different devices to access the Internet today, including smartphones and tablets. For this reason, it is important to make sure you utilize a responsive design. What this means is your eCommerce store will conform to the device customers are using to make it look great on all platforms. Going mobile and adding promotions to your landing page are all great ways to bring in customers who will stay. Pop-ups are a major annoyance to users. Simply put, pop-ups disrupt the flow of your eCommerce site. For this reason, you should avoid this type of advertising at all costs. While advertising is an important source of revenue for many businesses, it is better to choose banner ads or other static ads on your site, rather than using pop-up ads. Make it easy for customers to get around your online store. A search box and site map can go a long way toward helping people find what they need before they become frustrated and leave. Add related links to pages as well to help your users find their way around more easily. When you make it easy for customers to use your eCommerce store, they are more likely to return. Your landing page needs to make a great first impression to viewers. The design should be engaging and uniform for the best possible impact on your customers. For instance, you may wish to use graphics and colors that reflect a specific season to get people in the mood for holiday shopping. The key is to capture your audience and keep them on your eCommerce store with a solid Web Design. Most eCommerce stores understand the importance of compatibility with various browsers. 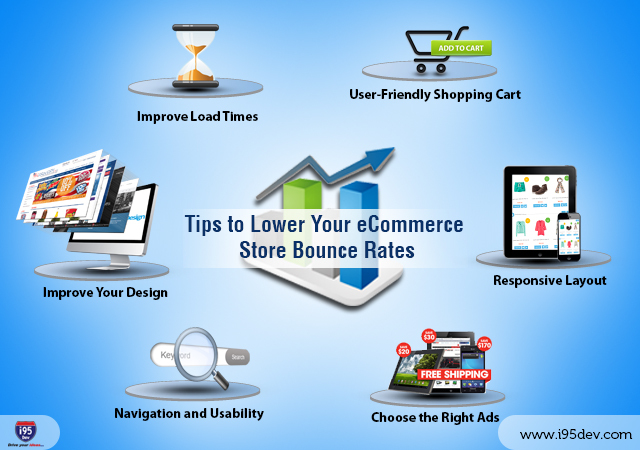 However, there are many other aspects that should be considered to decrease your bounce rates and keep people on your store website. Your online presence is critical to your success. If you need help following these tips to enhance your eCommerce Store, contact the professionals at i95Dev. We can help you attract customers, improve customer satisfaction and effectively manage your online experience.